The county-wide day of learning is October 8, 2018. 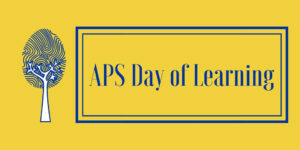 APS educators choose sessions that are aligned with the key areas of focus within Arlington Public Schools. Sessions offered are three-hour sessions in the morning from 8:30-11:30 at various locations. For the afternoon, educators gather in their building with their collaborative learning team to share learning and plan from 12:30-3:30 with lunch “on your own” from 11:30-12:30. Please read the descriptions carefully as some sessions are specific to certain groups. Many of these sessions will also be repeated on the countywide early release days 12/12/18 and 2/13/19. Please bring a laptop or iPad to access session materials. Register in ERO by Wednesday, October 3. Use this tip sheet to help you log into ERO. You need to be logged into your APS Google account to access the Day of Learning Google Site. School-based and central office Administrative Assistants in collaboration with his/her supervisor select either the AM offerings or the PM offerings (half-day). Morning offerings are 8:30- 11:30 and afternoon offerings are 12:30-3:30. All these sessions will be held at Washington-Lee High School. Park in the garage adjacent to the school over Rt 66. Register in ERO by Wednesday, October 3. Use this tip sheet to help you log into ERO or watch this video.